The Dell PowerEdge T440 is perfect for a range of office workloads, including work group collaboration and productivity applications, mail and messaging, file and print serving and web serving. 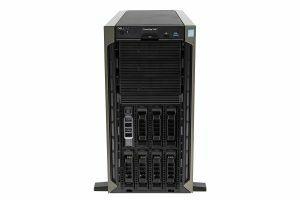 This dual-socket, tower server supports up to 2 x Intel Xeon Scaleable processors and comes with 16 x DDR4 DIMM slots in 3 chassis configurations: 4 x 3.5” cabled SAS/SATA drive bays; 8 x 3.5” hot-swap SAS/SATA drive bays; 16 x 2.5” hot-swap SAS/SATA/SSD drive bays. Choose from one of our suggested specifications below or configure your own PowerEdge T440. Your server will be built, tested and updated by our engineers before being shipped to you.